A new report published in Nature Ecology & Evolution attempts to map out how consumption of goods in one country threatens species in other countries. The researchers hope their work will help create valuable new links between human actions and their consequences on the natural world, especially when it comes to the well-being of vulnerable and endangered species. "Once you connect the environmental impact to a supply chain, then many people along the supply chain, not only producers, can participate in cleaning up that supply chain,” said Daniel Moran from the Norwegian University of Science and Technology, a co-author of the study. The researchers focused on biodiversity hotspots, which are some of the last reserves of thriving biodiversity on the planet. Even small economic pressures can have a large impact on species in these places. 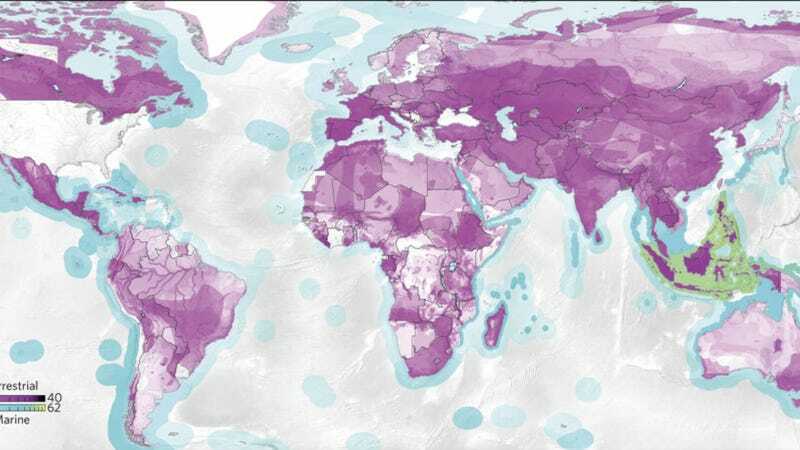 This map shows the species threat hotspots caused by U.S. consumption. The darker the color, the greater the threat caused by the consumption. The magenta color represents terrestrial species, while the blue represents marine species. When it comes to U.S. consumption patterns, the researchers found that not only do our shopping habits threaten species in expected places like Southeast Asia and Central America, but also southern Europe, southern Canada, and the Iberian Peninsula. The linkages are not always intuitive or direct. Growing demand for olive oil from Spain and Portugal could be increasing the threat to endangered Iberian lynxes by driving new dam construction and irrigation controls. When countries export goods to consumer-crazed places like the United States, it creates new sources of pollution on their home turf and leads to destruction of critical habitats to make way for agriculture, forestry, and urban sprawl. "In many hotspots, export industries continue to drive overexploitation," states the report. "Conservation measures must consider not just the point of impact, but also the consumer demand that ultimately drives resource use." Moran said that Southeast Asia—one of the last major stocks of biodiversity, is undergoing rapid economic development—and thus accounts for a large part of the planet's export-driven footprint. According to Moran, using a top-down method of analysis allowed them to develop a more complete picture of threats as compared to looking at one product and one species at a time, which leads to weak connections. The analysis aims to incorporate a combination of factors including habitat loss, habitat fragmentation, and pollution. Enlargements are shown for hotspots in Latin America driven by U.S. consumption (a); in Africa driven by European (EU27) consumption (b); and in Asia driven by Japanese consumption (c). Human activities are causing Earth’s sixth major extinction event—an accelerating decline of the world’s stocks of biological diversity at rates 100 to 1,000 times pre-human levels. Historically, low-impact intrusion into species habitats arose from local demands for food, fuel and living space. However, in today’s increasingly globalized economy, international trade chains accelerate habitat degradation far removed from the place of consumption. That study found that consumers in developed countries cause threats to faraway species through their demand for imported commodities such as coffee, tea, sugar, textiles, fish, and other manufactured items. The analyses do not cover illegal wildlife trade, an increasing problem in its own right that threatens dozens of rare animals valued for their parts (ivory, rhino horn) or as pets. The researchers hope their findings will help create better regulations, more sustainable supply chains, and improved consumer product certification and labeling. Part of this will include reallocating the way conservation funding is spent. According to the study, it has been estimated that up to 90% of the $6 billion of annual conservation funding originates in and is spent within economically rich countries. "Yet these countries are rarely where threat hotspots lie," reads the report. "Directing funding back up along their supply chains, toward the original points of impact, could help to yield better conservation outcomes." For the time being, the researchers note that almost all food and fibre from these hotspots is implicated in some way. They hope NGOs, consumers, and other stakeholders will be more likely to engage in finding longterm solutions if they can see the biodiversity footprint on a map. To perform the analysis, the researchers traced commodities from 15,000 production industries to consumers in 187 countries using a global trade model.